First, create your custom image sizes. Next, assign variables to your custom image sizes. Then, retrieve the image in those sizes. Finally, here’s what it looks like all together. Don’t torture your mobile users. 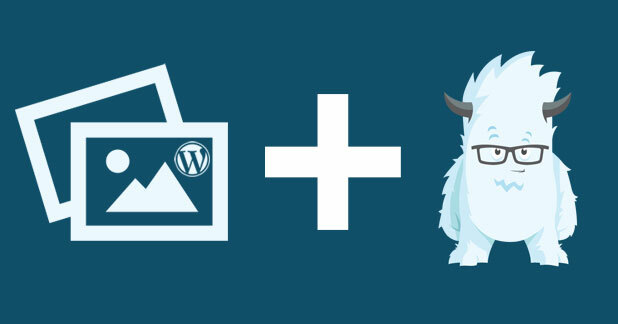 Code better responsive images in #Wordpress with #Foundation. Checking picture on caniuse.com for support – not very good. Reading Chris’ WordPress solution and Eric’s charming article (OMG the peas! ), I liked the idea of swapping out image sources depending on the viewport. Eric goes over some issues of trying to write this manually, mainly breaking your head with media queries and superficial mathematical equations that aren’t dynamic enough for the site if something changes. Oh and yucky markup. Chris Coyier uses WordPress’ add_image_size function and several PHP functions to extend PictureFill. 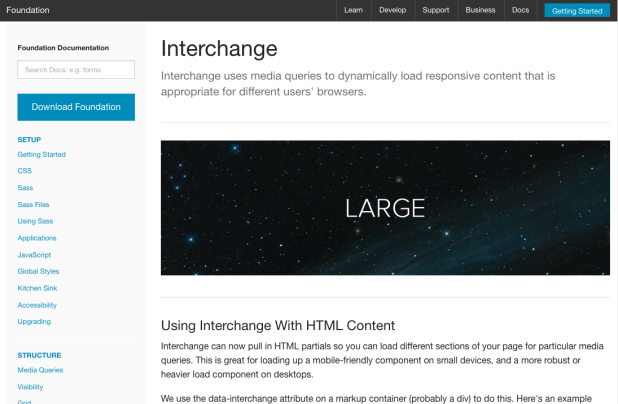 Foundation’s page for their Interchange component – greatest thing ever! I don’t have to use PictureFill as this does the same thing except already integrated into my project. 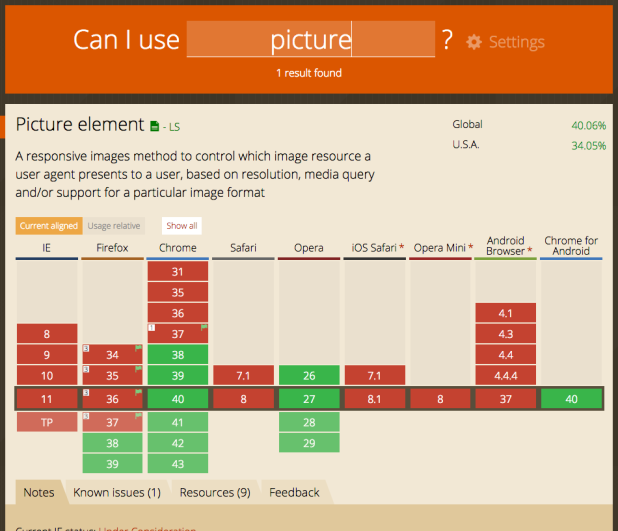 I don’t have to worry about browser support for the picture element or srcset. Lastly, I can write less PHP as I’m only using one function from WordPress to get started. All wins! Of course, I only recommend this if you’re already using Foundation. If not, I vote PictureFill as the best way to go. Basically what this function does is create three new images sizes based on the maximum size of Foundation’s default breaking points. I confess that I didn’t use ems because I’m not cool and am more familiar with pixels than I am with other units. But PHP makes me feel cool? Does that count? No? Okay, moving on. The add_image_size function takes advantage of WordPress’ out of the box functionality where every time a user uploads an image, it saves into the media library, and then copies those images in specific sizes within the “wp-content > uploads” folder of the WordPress site. 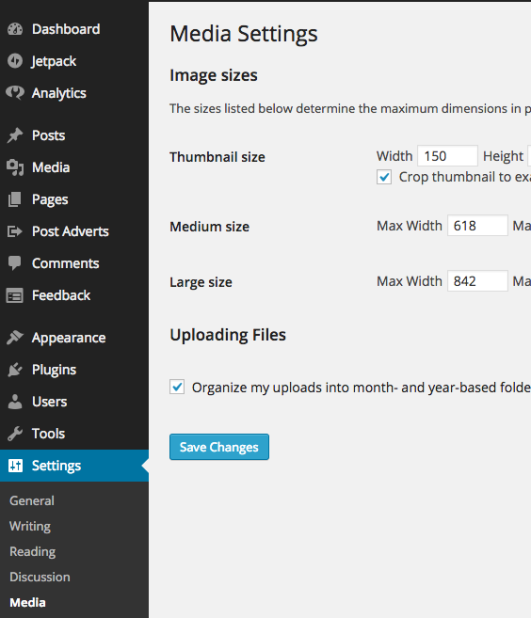 This is where WordPress uses the default 3 image size settings you’ll see if you go to “Settings > Media” on your dashboard. You’ll usually see thumbnail, medium and large. So instead of relying on WordPress’ built in sizes, we’re creating our own. This is a great way to go about this because you don’t have to depend on your client to upload images of several different sizes. Instead, they can upload the maximum size of their image, and WordPress will take care of the rest with our customizations. Then I went into my theme files, wherever images were being pulled, and threw one of these in. Depending on whether I was swapping out an image source, a background image, or a featured image, the code is slightly different. I’ll explain case by case. But first, let’s go over what we’d need in general no matter the case. At the top of a template file that I’m working in, I dropped this in. Notice how ‘large-hero’, ‘medium-hero’, and ‘mobile-hero’ all refer to the sizes I created in my functions.php. All I did here was assign the sizes to variables to make code cleaner as we go on. Depending on where your image is coming from, this may look a bit different. *Special Note: If you’re using ACF, make sure your image field is returning the object for this to work in the templates. Thanks, Mark! Choose to return object on your ACF field on the dashboard settings for Custom Fields. I’m using get_sub_field from ACF to grab the image field object. Then I’m taking that object, and grabbing the urls for each specific size. These urls are assigned variables for our upcoming step. This is the same solution on Chris Coyier’s, “Get Featured Image Url“. I’m grabbing the ID of the post thumbnail. Then I’m using that ID in wp_get_attachment_image_src to get the 3 objects, one for each custom size. Then I filter it down to retrieve the urls for each size, and assign them to variables for our upcoming step. I broke the examples up into pieces to hopefully make it easier to understand how it all comes together. Now this is what it all looks like in one chunk within a template file. And that’s the entire solution. So far, it’s working out for me and is something I plan to continue using in my WordPress/Foundation projects unless either, one, the site needs IE support (ick) or two, srcset and picture gain better browser support. Right now with these examples, the images just swap out between the three custom sizes that were set in functions.php. For them to re-size to their containers, that will take a little CSS. Most likely the “Meh, use width 100%” line I was poking fun of earlier. It’s fine to let the browser re-size an image slightly versus re-size a giant 1400px image down to a 320px screen. It’s also fine so long as you’re not letting the browser do the bulk of the image work. Just read an article recently that was some good food for thought, “Battle of the Image Compression WordPress Plugins.” Definitely take a look – it’s a good read. I’m interested if anyone else has had any success implementing this solution or maybe alternative ones in WordPress using Foundation. As I’m fairly new to the framework still, I’d love to swap tricks. Criticisms? Praise? Be sure to let me know in the comments. Also if you really liked this tutorial, I’d love it if you subscribed! More WordPress goodness will be in your inbox. Just click the ole’ “Subscribe” button on the top right sidebar. Previous Post Foundation, Underscores and Sass, Oh My! Really interesting approach. I keep meaning to dig into Foundation more. I’ve just been building with Roots and Underscores for quite a while I don’t take the time to venture out. Definitely a big need for the picture element to get more browser support, that really should be the go-to solution in the near future, silly to have to rely on JS for this sort of thing. Also thanks for the shout out to my Image Compression article. Seems like you have some great media related content here too. Subscribing now and looking forward to more great articles from you. Thanks! 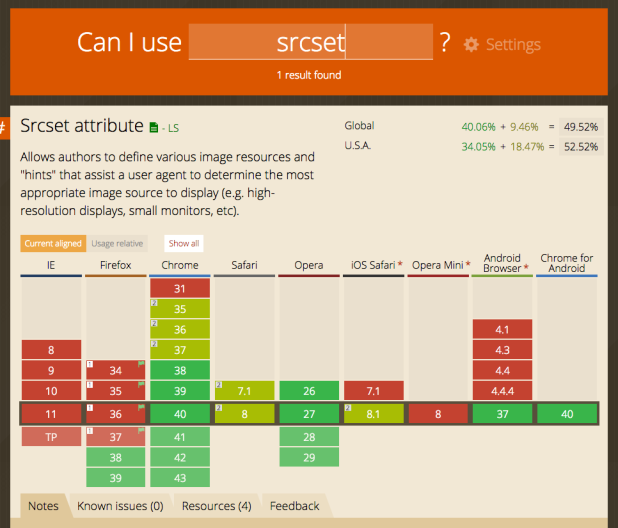 I agree that we shouldn’t have to rely on JS to get the most out of responsive images – I really loved the idea of srcset and the picture element just swapping out image sources, but the browser support killed my chances at using it. I can’t wait until it becomes a standard across the modern browsers, it will definitely help out. And np! As someone who’s used Eww and heard of Kraken, your article really helped me figure out the difference between the plugins. There are so many plugins that seem just as popular and do almost the same thing – it’s hard to choose sometimes so your article helped out. Thanks for reading! I appreciate the subscribe. I subscribed on your blog as well. Looking forward to swapping WordPressy code magic. Take care. The best blog I ever read…cool man! No edit option unfortunately… 🙂 cool lady! I really want this! I’m at a loss as to why this looks like its working in inspect editor as the urls are populating as expected but I do not see an image. My initial thought was foundation.interchange.js wasn’t referenced but adding it made zero change. I’m sorry to hear it’s not working. This tutorial is a few years old already, so it’s possible that Foundation’s code has changed or there is a better approach now than what I wrote about here. The way I like to troubleshoot is to simplify the problem. Looks like my tutorial gets a lot of things from a lot of functions. I would comment it all out, start from the beginning, and variable by variable/function by function, var_dump the values to see if something is failing somewhere. Also, if you see something being returned when you var_dump, but it’s not displaying, try using PHP’s “echo” to visually show the value.